I doing some testing and I needed an over/under extrusion test I can repeat with different settings without wasting hours or tons of material - so I designed this little thing. It uses about one gram of filament and takes 7 minutes to print - and you can know if you have over or under extrusion without any tools. Print with 0% infill and 1.2mm shell thickness (3 shells) for 0.4mm nozzle, wait for it to cool down before taking it off the build plate. This specifically tests edge extrusion, all the corners are rounded to a avoid corner over extrusion and the bottom is slightly tapered to avoid any measuring problem due to the first layer (that often bulges a bit because it is squished to improve adhesion). To test with calipers: print one, measure to inner and outer part (see image) if the outer part is bigger the difference is your over extrusion, if the inner part is bigger the difference is your under extrusion. 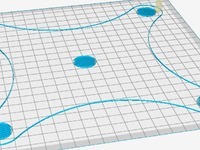 To test with no tools: print two, they should fit together perfectly (see image) and stay connected, if they don't fit you have over extrusion, if there's space between them you have under extrusion. 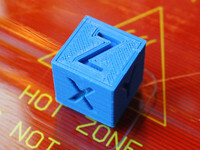 @gork made a calculator you can plug the actual measurements of this model printed on your printer and it will give you the flow value you need to set in order to compensate for over/under extrusion.